Starting off the new year resolved to get a handle on your budget? Then ditch those high-bucks vacations and transform your own yard into the best getaway spot of all. You can create an oasis in your backyard that is irresistible, with projects that are fun, simple, and quick. Using these ideas you can have a yard you will not want to leave this year! By creating an inviting outdoor living area on a deck, patio, or porch, you are able to bring your life and home outdoors. To be sure furniture is arranged for good relaxation and conversation, place seating the same as you would for a family room. Use comfortable pillows and cushions covered liberally in outdoor fabric, making this room the most popular spot outdoors. Add landscape lighting and it’s even usable after dark. If there’s a little more room in your budget, consider adding an outdoor fire place, or even a more economical fire pit. There’s nothing like a fire in the evening to make for an inviting spot to gather. There is something relaxing and soothing about watching butterflies float on the breeze. Fill your yard with flowering plants that are nectar-rich and be ready for monarchs along with other flying beauties to stop by regularly. For easy care, use long-growing perennials. You’ll enjoy the view from both the flowers and the winged jewels. Don’t overdo the planting right next to your home. Too many plants overcrowding your house’s edges waste money while creating more work for your later. Plants right up against the foundation can be difficult to care for, so opt for low-maintenance shrubs that soften the look but don’t need much attention. That gives you more time to relax. Create a simple planter fountain using a terra cotta bowl that is low for the base, while using an azalea container to support a strawberry pot and a small hidden water pump. The sound of flowing water just can’t be beat, and it will give you the feel of the tropics. Delight in your yard on a hot summer day by using color to cool off. Paint planters and outdoor furniture cool blues and arbors with wisteria of a light color. Another way to help a sweltering yard feel breezy is to add white and light blue hydrangea plants. On your patios and porches install light sconces which are gas, making your home feel as if it is in New Orleans French Quarter. The space will have a warm glow cast throughout it, perfect for enjoyment after sundown. Another great option is low-voltage landscape lighting. 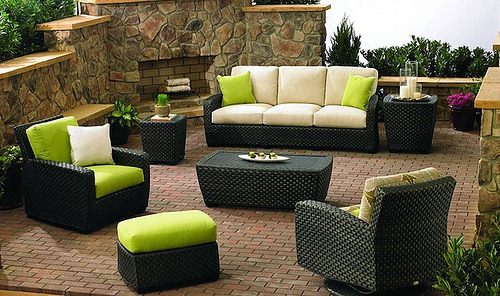 What you’re going for is soft light that makes your outdoor living space inviting and romantic. With the use of string of party lights, there is something special that comes to a yard. This is true no matter what you are enjoying, such as dinner party, or dinner out back with family. Use two trees to tie up a set, and then add some wine, friends, and there is your party. If you’ve resolved to turn your yard into your own getaway oasis this year, let’s get the planning going now! It’s the perfect time to talk about design so you’re ready for spring installation. We are a licensed MN landscape design and installation contractor, and we can work with you for the yard of your dreams. In the meantime, check out our Pinterest boards for some inspiration.